It's getting to the point where these vacation posts are rather orphaned out here in the middle of December. But since this blog is little more than my personal scrapbook, I wanted to post a few pictures from our post-race time in Nepal. All four of us — Beat, me, Steve, and Martina — were more wrecked from the 220-kilometer stage race than I think any of us anticipated. Before the trip, we had discussed the possibility of a fast-trek to Annapurna Base Camp, but decided that two big treks in two weeks may be more than our bodies could handle. Although in some ways I wish we'd just rallied to do it, in truth it would have been a terrible idea. Steve had Achilles problems, Martina had foot pain that made it a struggle to walk around town, I was wasting away, and Beat was just sick of all of us (I kid, I kid.) Ascending to 17,000 feet in the space of three to four days, in our condition, likely would have been a disaster. Instead, we toured the popular spots around Pokhara, and it admittedly was fun to be a true tourist for a few days. 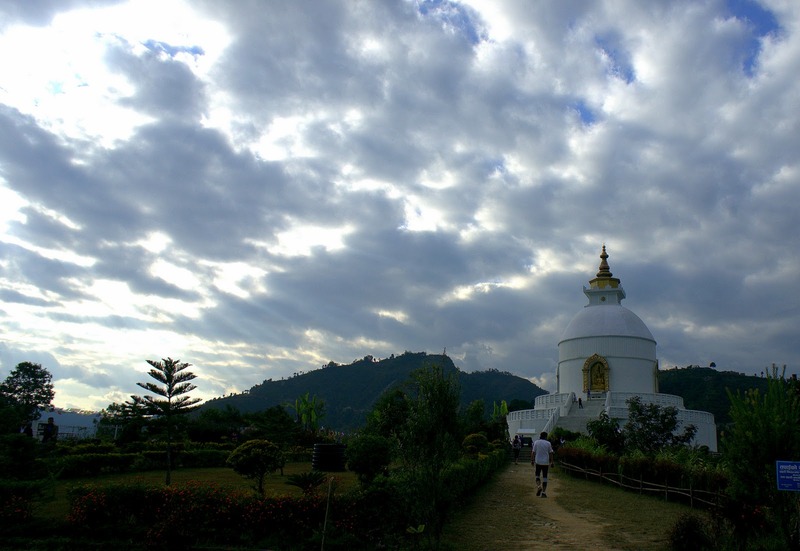 The above photo is the World Peace Pagoda, which was constructed by Japanese Buddhist monks to promote — surprise — world peace. It is a beautiful structure, built on a ridge above Phewa Tal with fantastic views of the valley. However, increasing cloudiness throughout the week prevented us from ever seeing another real glimpse of the Annapurna Range. We hiked up to Sarangkot, another point on a ridge about 2,500 feet above Pokhara. The hike felt short and sweet after RTP Nepal, and we stopped for a lunch of momos and soda at the top. True luxury. Sarangkot is also a popular spot for paragliders. 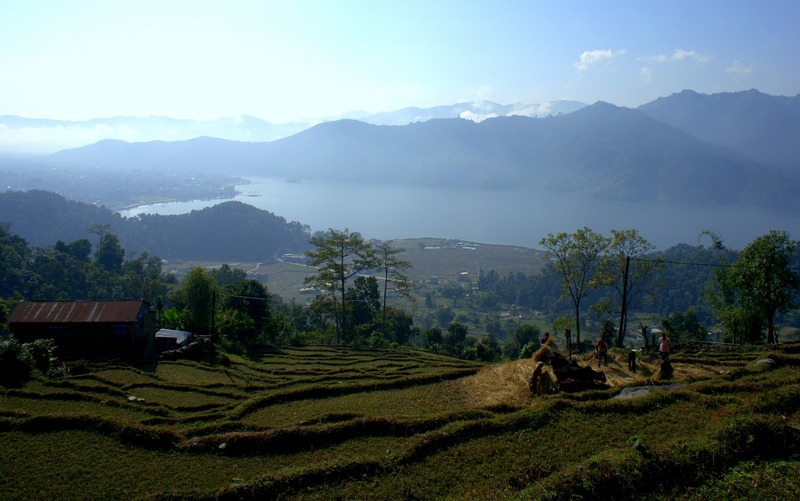 A "suburb" of Pokhara called Lakeside and Phewa Tal are shown below. After a few days in Pokhara, we climbed into another (slightly less death-defying) taxi for a ride down to Chitwan National Park, located in the subtropical lowlands of southern Nepal. 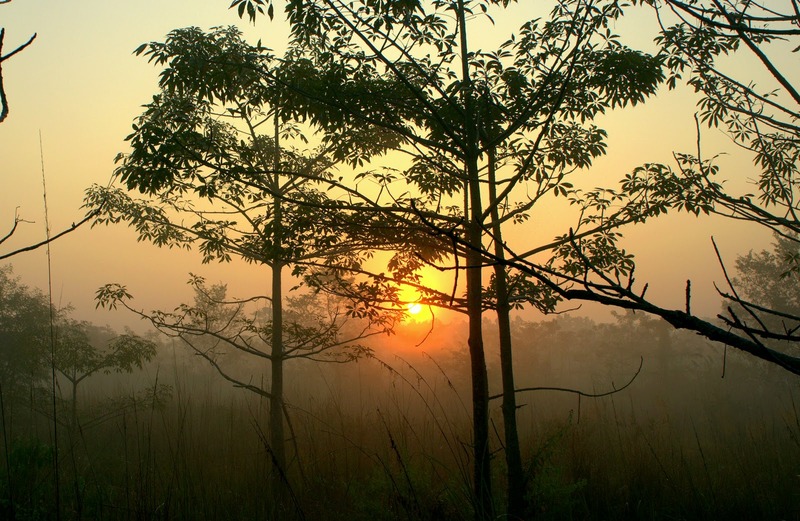 We stayed at the Chitwan Jungle Lodge, which had the amusing perk of elephant safaris. 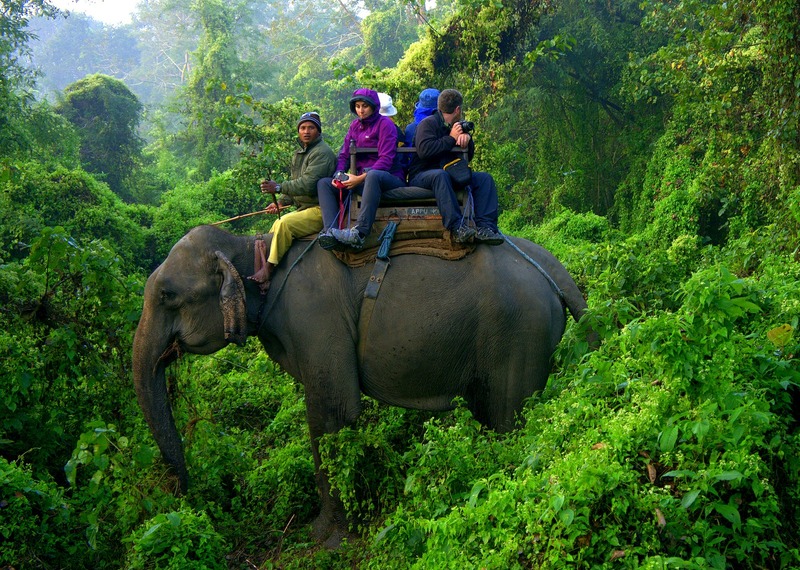 Because Chitwan is so dense and undeveloped, elephants are actually the only "vehicles" that can navigate the terrain. (People on foot can as well, of course, but park officials —soldiers with guns — don't allow tourists to hike beyond lodge grounds out of fear they'll be stomped by rhinos or eaten by tigers.) The lodge employs domesticated elephants from India to haul the tourists around the jungle and look for wild animals, which sometimes include wild elephants. We saw a rhinoceros, a crocodile, fresh tiger tracks (no tiger), and lots of deer, birds and warthog. Nothing that I was able to capture with a decent photograph. Riding elephants through the jungle was definitely a highlight of the trip, and allowed me to live out my childhood "Indiana Jones" fantasies. Yes, we did feel uneasy about the use of elephants as pack animals. However, the elephants at the tourist lodges appear healthy and well-treated, and the flow of tourism dollars does promote continued protection of the national park and the endangered animals therein from the lucrative poaching industry. It's certainly a double-edged sword. 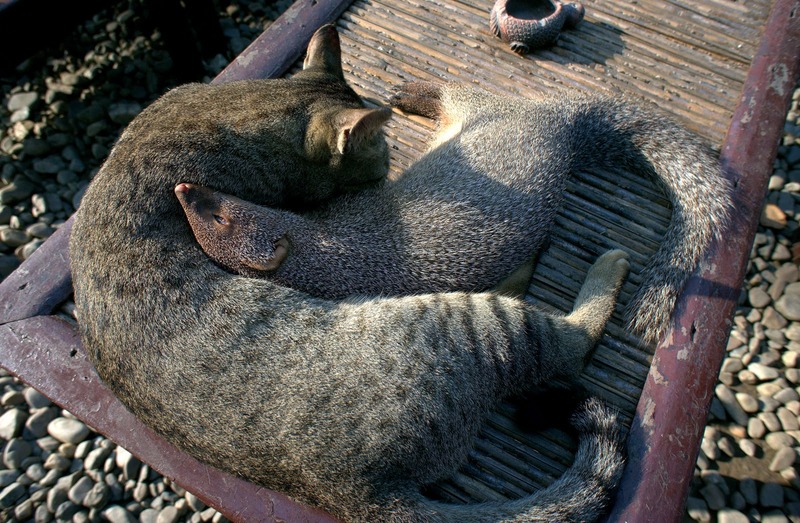 But perhaps even more than the elephant rides and rhino sighting, the highlight of Chitwan Jungle Lodge was this pair: a 2-year-old cat and her mongoose "kitten." The story of how they came together is simultaneously tragic and touching. 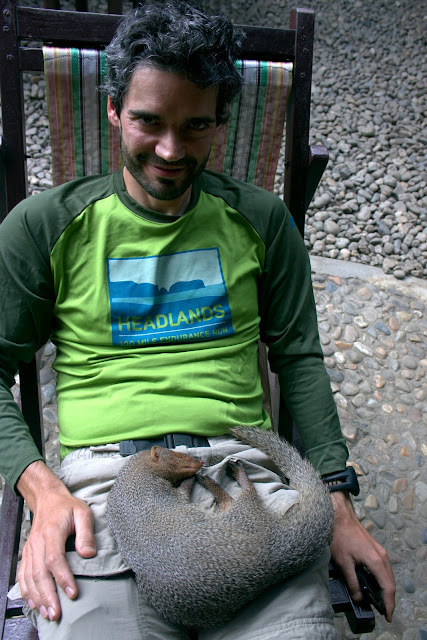 When the mongoose was just a few days old, lodge employees found him alone and apparently orphaned. They brought him back to the lodge and fed him scraps of food until he was healthy enough to move around on his own. It was during this time that the cat gave birth to a litter of kittens, which the young mongoose found and killed. The cat, either grieving or confused, began to nurse the mongoose as though he was her own kitten. The two have apparently been inseparable ever since. The cat brings the mongoose snakes and rodents, cleans him, and cuddles with him. We watched them play together numerous times. And the mongoose, now six months old, has grown up thinking he's a cat. He behaves in very cat-like ways, prowling around the lodge grounds and slurping up the dregs of beer glasses. He especially likes to cozy up on guests' laps and fall asleep. It was all very cute and cuddly until he yawned, revealing a row of razor-sharp, cobra-slaying teeth. We spent our last day in Nepal back in Kathmandu, where we sprung for a room at the Hyatt because honestly, we were all becoming a little weary of third-world charm (and traffic.) We walked to the Boudhanath Stupa, a large Buddhist temple surrounded by more than fifty Tibetan monasteries. 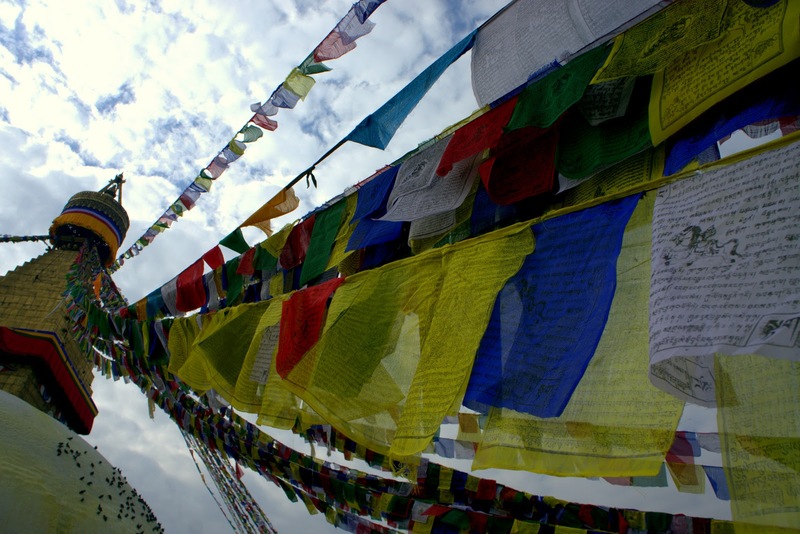 It's become the central location for Tibetan refugees in Nepal, and also the most popular tourism site in Kathmandu. Nepal certainly was the trip of a lifetime, and I loved being there. I'd go back in a heartbeat even if it included the guarantee that I'd have to fight "The Bug" all over again. Someday I will return to the Himalayas. Seems my first comment didn't work -- trying again. Will keep it simple and say thanks for these Nepal posts. I have enjoyed each one very much. Such beautiful images. 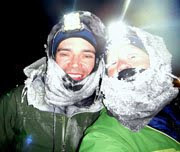 Thanks for the pics and descriptions of the pleasures and pains of this trip with us. Those are the most amazing photos and stories yet. What an unbelievable trip for you. SOunds like something you'll certainly never forget. Now get back on that bike (just kidding). As usual, thanks for sharing Jill. 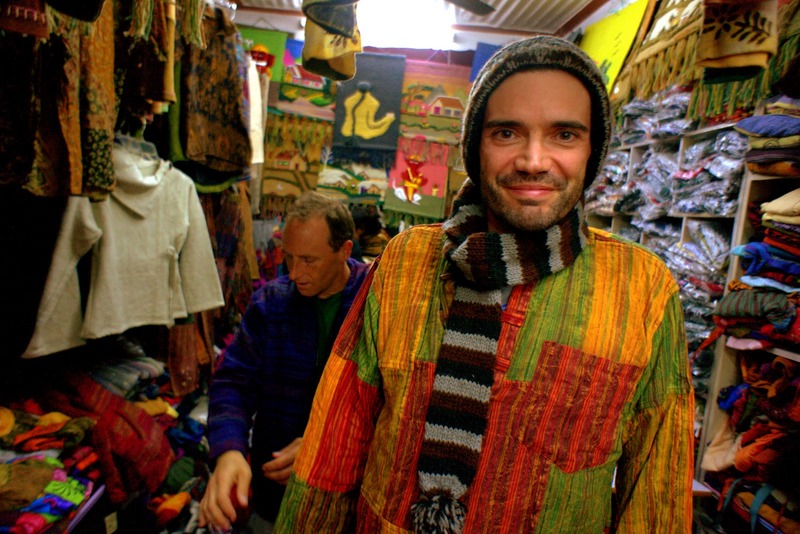 I've enjoyed all your Nepal stories and photos. What an amazing trip! Thanks for sharing your beautiful photos. I was hoping you'd show the post trip as well, esp. being in was in Nepal. Thanks for sharing! The word "Epic" (which is WAY overused) comes to mind when I think of this trip. First time I've seen a mongoose up close! (I lived in Hawaii 10 years and they are pretty much everywhere EXCEPT lying around on your lap like a cat!) Too bad you didn't make base camp, but you can only squeeze so much into a trip, and reality has to set in when everybody is demolished. Welcome back!